Reading and share top 9 famous quotes and sayings about Socialism And Capitalism by famous authors and people. 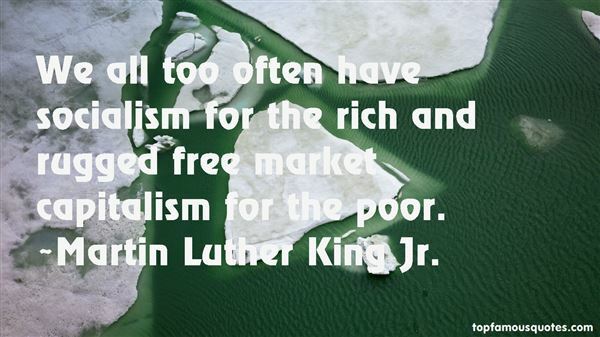 Browse top 9 famous quotes and sayings about Socialism And Capitalism by most favorite authors. 1. 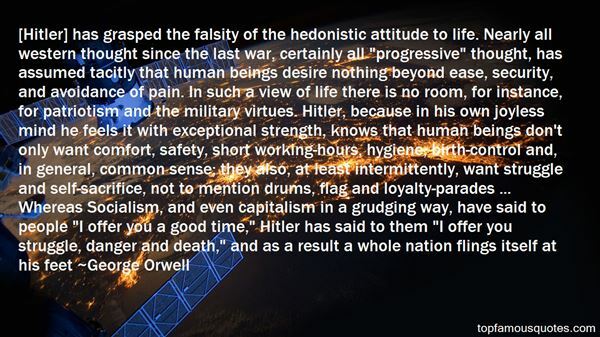 "[Hitler] has grasped the falsity of the hedonistic attitude to life. Nearly all western thought since the last war, certainly all "progressive" thought, has assumed tacitly that human beings desire nothing beyond ease, security, and avoidance of pain. In such a view of life there is no room, for instance, for patriotism and the military virtues. Hitler, because in his own joyless mind he feels it with exceptional strength, knows that human beings don't only want comfort, safety, short working-hours, hygiene, birth-control and, in general, common sense; they also, at least intermittently, want struggle and self-sacrifice, not to mention drums, flag and loyalty-parades ... Whereas Socialism, and even capitalism in a grudging way, have said to people "I offer you a good time," Hitler has said to them "I offer you struggle, danger and death," and as a result a whole nation flings itself at his feet"
2. "The left is back, and it's the only path we have to get out of the spot to which the right has sunken us. Socialism builds and capitalism destroys." 3. 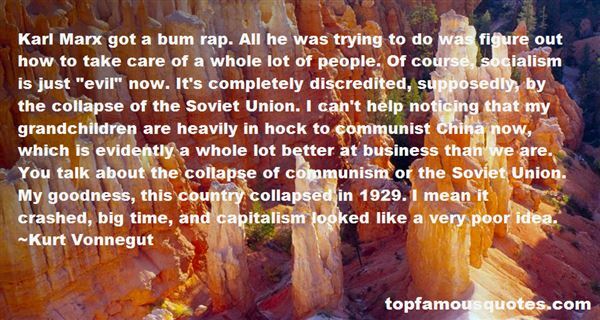 "Karl Marx got a bum rap. All he was trying to do was figure out how to take care of a whole lot of people. Of course, socialism is just "evil" now. It's completely discredited, supposedly, by the collapse of the Soviet Union. I can't help noticing that my grandchildren are heavily in hock to communist China now, which is evidently a whole lot better at business than we are. You talk about the collapse of communism or the Soviet Union. My goodness, this country collapsed in 1929. I mean it crashed, big time, and capitalism looked like a very poor idea." 4. "We all too often have socialism for the rich and rugged free market capitalism for the poor." 5. "The problem with K-12 education is socialism and the solution is capitalism." 6. "I was guilty of judging capitalism by its operations and socialism by its hopes and aspirations; capitalism by its works and socialism by its literature." 7. "There's Socialism and Communism and Capitalism and there's Feminism and Hedonism, and there's Catholicism and Bipedalism and Consumerism, but I think Narcissism is the system that means the most to me." 8. "The fear of capitalism has compelled socialism to widen freedom, and the fear of socialism has compelled capitalism to increase equality. East is West and West is East, and soon the twain will meet." 9. "Socialism needs to pull down wealth; liberalism seeks to raise up poverty. Socialism would destroy private interests, Liberalism would preserve [them] ... by reconciling them with public right. Socialism would kill enterprise; Liberalism would rescue enterprise from the trammels of privilege and preference. Socialism assails the preeminence of the individual; Liberalism seeks ... to build up a minimum standard for the mass. Socialism exalts the rule; Liberalism exalts the man. Socialism attacks capitalism; Liberalism attacks monopoly." Sometimes the further away the target, the less you have to try to get there."